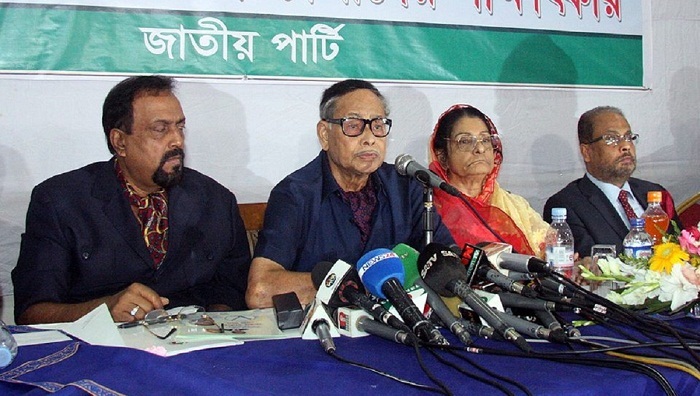 Jatiya Party Chairman HM Ershad on Tuesday said he will unilaterally finalise his party’s candidates for 300 constituencies and also decide it unilaterally whether he will join any alliance. “I’ll finalise the candidates for 300 seats considering the interests of the country, our party and its leaders and activists. I myself will do this job, and no one else has anything to do in this regard. I want to see how many competent Jatiya Party candidates are there in 300 constituencies,” he said. Ershad, an ex-military ruler, said he will also unilaterally take the decision if his party needs to go with any other alliance in the process of political polarisation. He came up with the remarks while taking interview of his party’s nomination hopefuls at a convention centre in the city’s Gulshan area. Earlier at a meeting of the party presidium members, Ershad was entrusted with all the responsibilities to finalise its candidates. The party also handed him over 780 nomination forms out of 2865 ones collected by party leaders to contest the 11th parliamentary elections.